Do you know about The Moonlighting Fallacy? It’s an incorrect theory that TV shows can’t resolve conflict or change any of their fundamental dynamics because it will cause the shows to crumble creatively and commercially. It primarily applies to U.S.T. – unresolved sexual tension. The most common victims are sitcoms and/or dramedies. Shows are scared to do something like put a couple together in a stable relationship because, then, what will keep the viewers coming? What juicy conflict will drive the show and hook bigger and bigger audiences? The Moonlighting Fallacy (named because the bizarre downfall of a TV show called Moonlighting after it hooked up two of its main characters) has had all sorts of negative effects, minor and major, on shows throughout the years through gutless television writing and plotting. I hate gutless TV because it doesn’t trust viewers to differentiate between quality and comfortable familiarity. The worst part is that shows usually decide to start living by The Moonlight Fallacy right at the top of their game, or at some sort of pivotal turning point. I’ll get to some examples in a few paragraphs. It’s like when the Patriots decided to start playing conservative football for the first time all season in the Super Bowl against the Giants. Everybody favored the Patriots in that game, and the Patriots seemed to bank almost entirely on this fact instead of playing the kind of football that got them that far. In short, I hate it when shows I like don’t trust me to still like their show even if they take creative risks and change the dynamic of the show. It infuriates me. Here are a few of the worst examples that have been on my mind recently. This is perhaps the most nefarious example of all. After a decent pilot, the show gradually improved in quality throughout the first season. By the second season, the writing was great, the characters likable, the romantic tension truly compelling. Ross is the lovable lug who had long secretly pined for Rachel. How long will it take her to realize it? And then she finally does! And she realizes how great he’s always treated her, and that she’d love to be with him, too! She makes this discovery while Ross is on a business trip. But Ross finally decides to move on from Rachel. He gets a new girlfriend while on his trip. In the interest of not ruining Ross’s relationship, Rachel decides to hide her new feelings. So now, their roles are reversed. This was a pretty brilliant scheme: The writing was good enough and the characters developed enough that the situation-flip allowed for a hilarious alternate reality from the first season. And then finally, Ross realizes that Rachel is into him. (Leading to one of the show’s all time great lines, after Rachel lies in a drunken phone message “I’m over you,” Ross says “You’re over me? You’re over me? When were you… under me?”) Ross had to make the difficult decision to end things with his steady girlfriend or start over with the girl of his dreams. But when he makes the tough decision to ditch Julie and date Rachel, the gutless television writing begins. We’ve had Ross pine for Rachel. We’ve had Rachel pine for Ross. They’ve decided they want to be together. There’s an obvious next logical step: Try putting them together. Roll with that for awhile. The characters are well-developed and the writers are competent. Instead, the show pulls out some half-assed obstacle to keep the two pining for each other. If you want to see poor plotting, go see The One With the List, the eighth episode of the second season. It’s incredibly frustrating. I suppose the new obstacle presented a slightly different dynamic, where Ross overtly pined for Rachel instead of secretly pining for Rachel, but it was really the same thing, but whinier. All of the gags seemed tired and redundant. At last, an incredible episode — arguably the best in Friends history (The One with the Prom Video) — finally hooked them up, almost making the stupid delay worth it. And, for awhile, the show creatively explored new area with Ross and Rachel together. It captured the beginning of their relationship, the disconnect between the two’s personalities, and their friends’ responses — all done pretty credibly. Unfortunately, somebody in charge, whether it be a writer or a producer, decided the show was losing steam. People don’t love Ross and Rachel when they stay together, these people decided. They love Ross and Rachel when they long to be together and eventually get together briefly. Who needs character development? So they repeated this plot. For eight more years. No, seriously. This same exact plot for eight more years. Talk about gutless. Alright, there are a few spins on it. One season they get together at a beach house! One season Ross almost gets together with someone else but says Rachel’s name at the altar, so he gets together with Rachel instead! One season they get together while drunk in Vegas and get married! They always break up (often blaming it on this one time Ross sort-of cheated on Rachel even though, as Ross claims about 1000 times, they “were on a break!”), but they keep on keeping on. Getting together one more time won’t hurt, right? It is heartbreaking to witness the gradual downfall of a great sitcom into an unfunny, self-mocking farce by its tenth season. And guess how the show ended? Yep! Ross and Rachel get together. Just like the people always wanted. I know what you’re expecting. I’m going to complain about how Jim and Pam, obviously perfect for each other, keep finding reasons to stay apart for three full seasons! Wrong! This is probably the best a TV show has ever handled a romance. I challenge you to find me a better, more rewarding TV romance. I’ve looked, and I couldn’t find one. The pacing is quite slow, but there’s a deliberate plan, and every obstacle develops the characters a little bit more. 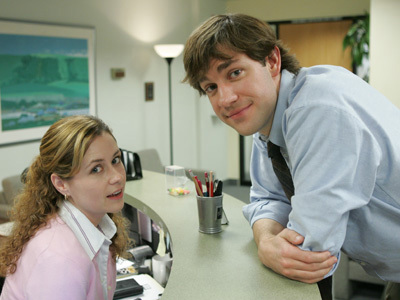 Six seasons in, the Jim-Pam elements have been perfect about 80% of the time, and the flaws have been minor the other 20% of the time. But The Office has had its share of gutless elements, particularly in the past two seasons. I briefly want to discuss two of them. First, the character Holly. What a great character. Seriously, Holly is one of my favorite TV characters of all time, even though we only see her for seven episodes. After four seasons of witnessing Michael bumble through two awkward relationships – notably, a vitriolic hell with former boss Jan Levinson – the writers decide to try something much more challenging: A perfect match for the out-there, dysfunctional manager! And so we meet Holly Flax at the very end of season four. She’s funny and dorky and kind and vulnerable. Credit actress Amy Ryan: all of this instantly detectable even as Holly is functional and seemingly normal as an HR officer. She and Michael hit it off pretty quickly. The irony that kills Jim is that Michael actually seems to have more moves than Jim with Holly than Jim had with Pam. This juxtaposition is really one of the more brilliant moves that The Office writers have made, which is why the end of season 4 and beginning of season 5 are some of my most rewatched episodes. Just as we see Michael developing a healthy, steady relationship that gives him growth… It disappears. Holly gets shipped away because the CEO is worried. I suppose this could be thematically intentional. Perhaps the writers see Michael as a Sisyphus character, doomed to repeat his suffering forever for metaphysical reasons. The world just works against him. It’s also possible that the show simply couldn’t afford Ryan as a regular, or she would’ve rather focused on movies. But I don’t like it. I call it gutless. We get Holly and Michael for a whopping six episodes, who call it off just as it starts to get good between them. I will credit the show for making the break-up just as moving and saddening as any real breakup. There’s no deus ex machina thrown in, like Holly having a secretly evil personality or cheating on Michael, to prevent the break-up from being challenging to viewers. If the show had to break up the characters, I’m glad they did the way they did. It nearly brought me to tears. I just know that the characters would’ve and should’ve stayed together longer than they had. There was a lot of plot and character growth to milk from a romantically stable Michael Scott. More than a few episodes worth. This brings me to the other instance of gutless television writing in the show’s fifth season: The Michael Scott Paper Company. It’s not the plot arc itself, or really any part of it, that I have a problem with. It’s the arc’s length. The show slowly built up to this climactic change to The Office dynamic: Michael leaving Dunder-Mifflin. It gave the characters several great moments leading to Michael starting the company. But, for some reason, after all that hard and brilliant work setting up The Michael Scott Paper Company, the show gave up after four measly episodes, two of which were about the company’s first couple of days. It really had the potential to last at least half a season, if not a whole season. The change in dynamic was a breath of fresh air for a show that otherwise was bordering on tiredness. Again, it’s not the way the show handled the abrupt conclusion — “Broke,” the episode Michael reunites with Dunder-Mifflin, might be one of the five best in the series history — it’s more the existence and timing of the abrupt conclusion. I blame fear or tepidness of fundamentally changing the show into something a little bit different and more complex. Unfortunately, it seems these questionable instances of TV writing during the fifth season were foreshadowing to the sixth season which is a monogamist with gutless plotting. Don’t even get me started on this season’s downfall of arguably my favorite TV show ever. I want to stress that perhaps the most frustrating part of The Moonlighting Fallacy is that TV writers decide to stick to it at the most pivotal times, even if they’ve been bravely defying the fallacy so far. This especially applies to a recent, egregious instance of gutless television from the fifth season of How I Met Your Mother. The show spent all of the third and fourth season scaffolding a pretty major change in dynamic that violated another long-assumed sitcom rule: Don’t have a main love interest hook up with another character than the one they’re originally linked with. I call this the Joey-Rachel Axiom after the brief affair between the two Friends’ characters in the ninth and tenth seasons that just felt so unnatural. Yet, HIMYM credibly pulled it off, and with its most caricatured main character: Barney. On the other end was main character Ted’s initial interest, Robin. The show spent all of season three slowly and successfully building chemistry between the two. The fourth season beautifully allowed Barney to mature from his womanizing ways as he learned to live with the tender part of his personality. Finally, the show eased the characters together in the Season 4 finale and the opening episodes of Season 5. The show seemed poised to pace the romance over at least a season, if not the duration of the series. It showed a different side of the characters that was a comfortable breath of fresh air. And then… they flush it all down the toilet seven episodes in. They pull a cheesy breakup episode with almost no emotional fallout in subsequent episodes. After two seasons of hard work to make the two a credible, entertaining, maturing couple, they decide they like simple, debauchery-loving Barney over human character Barney. At first, I convinced myself the “breakup” was a brief break, a roadblock for the RoBarn couple. But interviews with the show runners later confirmed that this was a permanent breakup. Even worse, these interviews confirmed that the choice to break the pair up was fear; they didn’t want to lose one of their “big draws,” Barney the single womanizer. I’m offended the writers believe people watch the show because of a recurring gag and not because of funny writing, well-developed characters, and attention to detail. I fell in love with the show as a complete package, not just a few funny elements stitched together. Anyways, these are a few of the examples of otherwise good shows losing their courage at the worst times. I have about a dozen more I could share, but I’m sure you can think of plenty on your own. I can’t believe I’m just seeing this…but I am, and I wholeheartedly agree with it. Although, you forgot to mention the other factor in the Ross/Rachel dynamic: the befuddlement that we have that Rachel would ever be interested in David Schwimmer. Snark aside, I’d like to add “Chuck” (Chuck + Sarah) onto the list of pairings that, because the writers were so afraid to eliminate the UST, just became incredibly annoying. Showrunners don’t seem to realize that the converse of UST is the “Goddammit, I used to like these two, but now they drive me crazy; just do it already” phenomenon. Also, if anybody out there besides me ever saw it, the show “Ed,” while awesome, suffered from this with Tom Cavanaugh and Julie Bowen. Where was I? Oh, yeah, defending Gossip Girl and referencing some early 2000s show about a lawyer who owned a bowling alley. Unfortunately, I don’t think this problem is going anywhere, and it speaks to the point you made about HIMYM’s ultimate downfall – trying to pair couples up when your show has an unknown/infinite end date. Hopefully, in the future, shows will be more willing to just do it already and then find new angles/conflicts to entertain us with.